Mesolipolysis or Injection lipolysis is, as the name suggests, using injections to lyse ( break down ) the lipo ( fat). Mesotherapy with lipolytic injections is best suited for areas/pockets of stubborn fat that do not reduce with drugs/ diet. The most popular areas for lipolysis injections are double chin, inner arms , love handles, below navel bulges, below bra bulges, below buttock bulges, etc. These injections are repated every 3 to 4 weeks. Injection lipolysis is often combined with cryolipolysis. The active ingredients in the injections are lipolytic, i.e. they cause fat to liquefy, dissolve and be eliminated from the body. It causes acute vacuolization of adipocytes and inflammation within the septae destroy the adipocyte cell membranes resulting in fat necrosis eventually. The destroyed fat is eliminated from the body by lymphatics. Its important to use the appropriate lipolytic agent for best results. The common ingredients are desoxycholic acid and phosphatidyl choline that are time tested and scientific trials to support their action on fat cells. Client selection is most important. Subcutaneous fat can be treated with lipolysis, intraabdominal fat cant be treated with these injections. 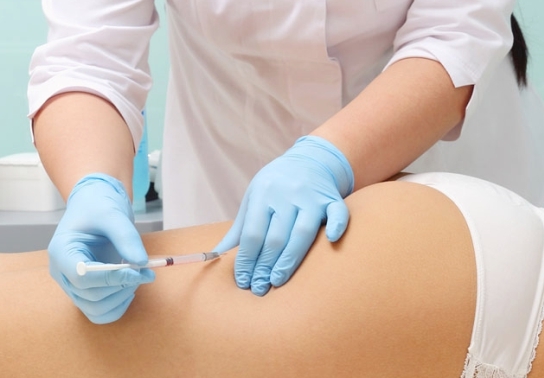 Injection lipolysis continues to be a time tested and effective treatment for small pockets of stubborn fat. It can be combined with other slimming procedures like radiofrequency, HIFU and cryolipolysis.